Dee Dee had been going to Memphis in the summers for 16 years, repairing substandard homes with a local organization called Service Over Self. Her and her family loved helping make homes warmer, safer and drier, but they were also often shocked at the level of despair that these homes were in. One day, someone asked Dee Dee if she would ever want to do the same thing in San Antonio, where she lived, since she loved it so much. Dee Dee literally thought, “There is not a need like this in San Antonio,” but after doing a little bit of research, she found that San Antonio had the highest percentage of substandard homes in America at that time! Since then, they have never looked back. Dee Dee founded Blueprint Ministries and, thanks to a family foundation, purchased the century old McKinley Avenue Church. And the stories only begin there. In 2009, after another family foundation provided for the repairs the McKinley Avenue Church needed, Blueprint Ministries began hosting summer camps where people would travel in, be housed and fed, and sent out to repair homes. It did not take long for Dee Dee to realize that many of the homeowners have a lifetime of stories, are wise and have things to say. “One of our biggest joys is to establish long-term relationships with our homeowners,” says Dee Dee. One of such homeowners is Mrs. Mondine. This is what they called her before they started working on her house and noticing her neighbors and friends refer to her as ‘Mama Mondine’ or just ‘Mama.’ Three years after they did their first repair on Mama’s house, she continually invited the staff of Blueprint Ministries to her house to celebrate MLK Day. They finally took her up on this and were blessed in doing so. 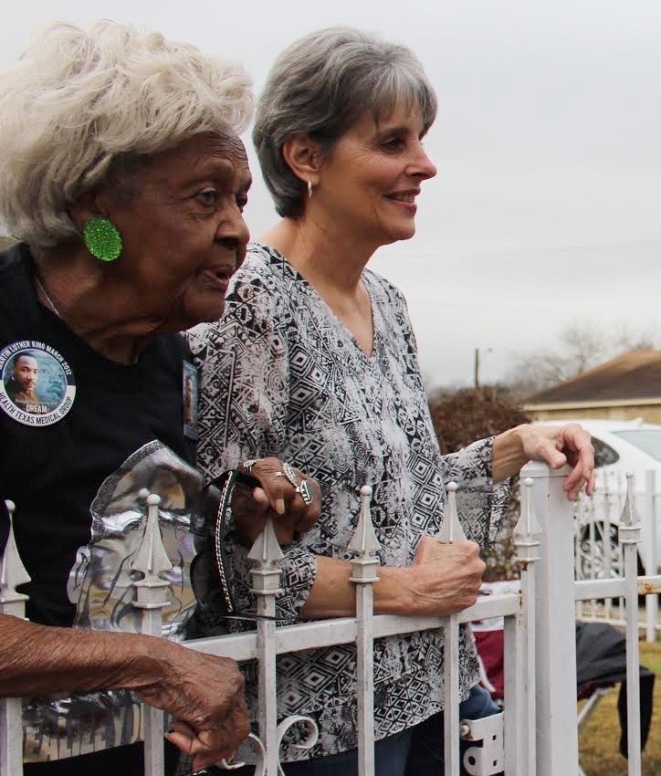 As the MLK March passed by the front of Mama’s house, a joyous and unifying moment, the staff soon realized they were not just at any mama’s house. Neighbors flooded in with food, those passing by called her by name, “Hi Mama,” and the first-responders came in for a hug. She was the Mama of her neighborhood and the Mama of MLK Day. “Now, we always send crews to Mama’s house, even to work on small jobs, with the hopes that some [of the volunteers] would sit at her feet,” says Dee Dee. You can get a group of friends together to serve Single-Day Construction jobs or on Overnight Construction Retreats. Blueprint Ministries is a Texas State Licensed Youth Camp and can sleep up to 150 volunteers in their beautiful McKinley Avenue Church. You can also gather a few of your friends to be Kitchen Volunteers, preparing family-style meals at nights for the construction volunteers. 100% of the food, materials and tools are provided for by Blueprint Ministries through donations of the community. Volunteers can also help with establishing long-term relationships with homeowners by volunteering at the weekly homeowner dinners, providing gifts every Christmas for the homeowners and their children/grandchildren, and delivering treats, such as banana bread, popsicles or toilet paper, to homeowners. Know of someone with a home-repair need? Blueprint Ministries requires homeowners to live inside Loop 410, be at or close to the poverty line, own their home, be without able-bodied people that could otherwise do the work, and have homes that do not require professional labor (electrical, plumbing or foundational work). All of Blueprint Ministries work is done by volunteers.